A phone was just a phone, today we can say that a smart phone is equivalent to having a computer in your pocket. With the increased capacity and computing power of today’s smart phones, it only makes sense that the gaming industry is looking at mobile devices as the next generation of gaming consoles. People are on-the-go more than ever before, and they want to take their gaming with them. Here is a chart showing revenue growth, and projected revenue growth, of the mobile gaming market. Between 2013 and projected 2016, the Mobile Gaming industry is expected to almost double in revenue growth. The average mobile gamer, in North America, spends $3.87 per month on gaming. Year-over-year growth, in North America, is 38%. Games can cost between $1.00 and $10.00. It all depends on the developer and the type of game. There are basically two different types of mobile games. Paid for games that may or may not have additional pay for play features. In the end it comes back to the developer of these games to make sure the player stays playing and spending money. The game has to give off a feeling of “instant gratification”. If the player spends money, they have to feel as though they’re progressing in the game. If not, the player loses interest. The solution: Mad Catz Mobile Gaming Controllers. Quite simply, these are gaming controllers that you pair up to your phone or tablet, via Bluetooth, so you can take advantage of the full-screen experience and enjoy your game more. With all these potential players, and what they’re already spending, they’re not going to be afraid to spend a bit more on a controller that will help them advance in their game and enhance the overall experience. The retail cost associated with a Mad Catz controller is really a “drop in the bucket” compared to how much these gamers are already spending on buying the game and then using the pay-to-play feature. Mad Catz is all about the mobile gaming experience. They’ve been developing products for all consoles and handheld gaming systems, since the days of the original Nintendo Entertainment System and GameBoy. They sell their products under the Mad Catz, Tritton and Saitek brand names. Categories include headsets, gaming mice, gaming keyboard, specialty controllers and control pads. Mad Catz is headquartered in San Diego, California with sales offices worldwide, including the UK, China and Korea. have an absolute global presence. Gamers worldwide recognize Mad Catz products for their quality and value. For all Mad Catz gamepads, there is a choice between the regular sized gamepad or the micro version, both use Bluetooth to connect to your device. You can choose between black or white. For the Android, C.T.R.L.R version, battery life can be up to 40 hours on the micro gamepad and up to 30 hours on the regular sized gamepad, via Bluetooth. There is also a “mode” button on the bottom of the controllers so you can pair them up to your PC, Mac or even other gaming consoles. You can also use this switch to turn on “mouse mode”, with a pointer on screen or “PC mode.” Each controller gives you a traditional gamepad experience with physical action and shoulder buttons, D-Pad and analog stick. An adjustable clip is also included in the box, so the game can “mount” on the user’s phone above the controller, allowing for a very immersive experience. With the C.T.R.L.i – Apple version, you get exactly the same experience, except the controllers are MFi certified (Made for i-devices) by Apple; this means that they’ve been tested and given Apple’s “seal of approval”. Consumers will also notice that the C.T.R.L.i gamepads also have coloured X, Y, A, B buttons. Cesium also carries the R.A.T.5 gaming mouse built for both PC and Mac. You can quickly and easily customize the functions of this mouse through the use of programmable buttons. Features include: length adjustment and a custom weight system. 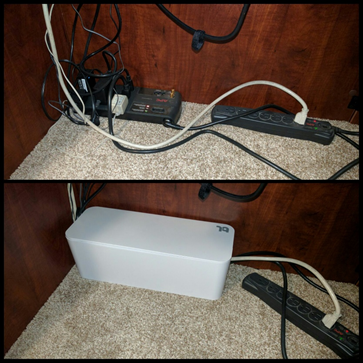 You can add or subtract up to five 6-gram weights into the mouse. The mouse tracks at 5600 DPI (dots per inch), making it one of the most precise mice on the market. There is also a thumb scroll wheel, along with the traditional left and right click buttons. Free software is easily downloadable if you want to create a customized profile for your game. The S.T.R.I.K.E.M keyboard is a wireless Bluetooth keyboard. Compatible with Mac, Android, iOS, OS X and Window. It comes with a supplied travel pouch and tablet stand. The LED backlighting adds for a cool effect and is adjustable. The internal battery is rechargeable and can last up to 18 hours. Mad Catz bridges the gap between gamers and mobile gaming to allow the user to unleash their full potential and fully enjoy the gaming experience. With the growth of the gaming industry, it is time to get on board and be part of this new and exciting evolution and market segment! Ballistic already hit a home run with their original Jewel case, available in a wide array of colours. This case offers 6-sided protection in a simple 1-piece design that is easy to put on and take off. Ballistic has now taken the Jewel to the next level with the Jewel Mirage series. The Jewel Mirage Series features a unique laser etched design. You can choose from Gold or Silver base colours, with either a Kasbah or Retro graphics design. The laser etching design is coated to prevent chipping and everyday wear and tear. The corners are raised, as with all Ballistic cases, to help absorb impacts. This is due to Ballistic’s patented “Ballistic Corners” technology. This case features Ballistic’s signature 6-foot drop protection, slim design and raised lips to help round out this case to ensure that it is the perfect match for any minimalist that wants protection for their device without sacrificing style. If you need a clear case, with tested drop protection (that isn’t bulky) and want to add some style to your device, then the Jewel Mirage series is the perfect choice! 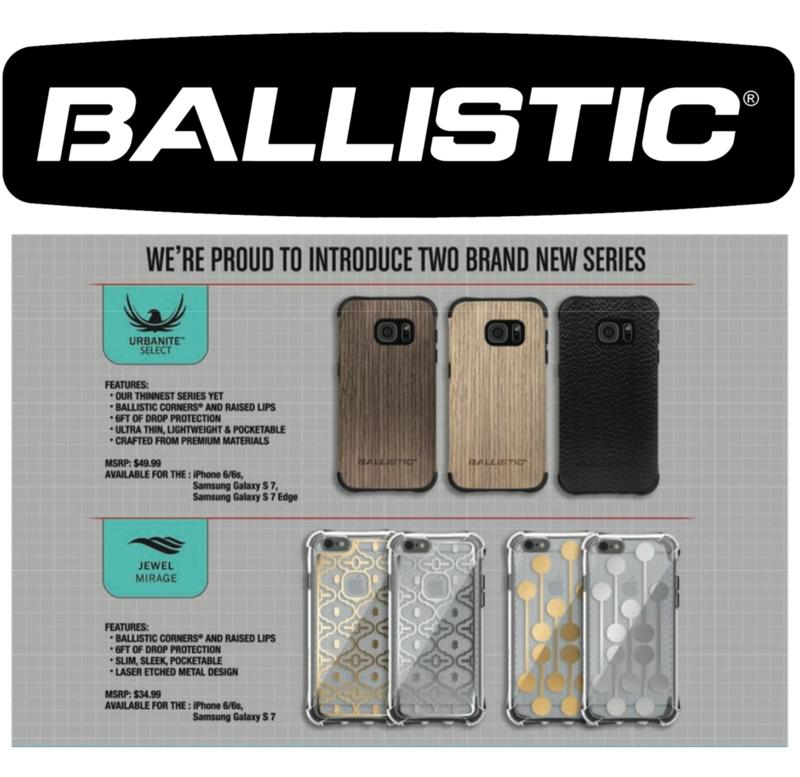 The second new line-up Ballistic has launched is the Urbanite Select series. Ballistic took their popular Urbanite series to the “organic level” and added a thin layer of ash wood to these cases. It’s coated to allow flexibility while still protecting your device. You can choose from Dark or White Ash Wood colours. If wood isn’t your thing, then check out the Buffalo Leather option. Again, a thin layer was added to the back of the case, adding grip, a unique look and some style. As with the Jewel series, you can expect the usual 6-foot tested drop protection, 6-sides of protection and raised lips. These cases are still very easy to put on and take off, and will slip into and out of any pocket with ease. If you want to add some style and an “organic” look to your device, then the Ballistic Urbanite series is the one for you!